Mac Mini Disk Speed Tests + T3 bus's + Q&A! Discussion in 'Mac mini' started by jrlcopy, Nov 7, 2018. Ask me anything, got mine today! i7/8gb/1TB, planning on adding the eGPU tomorrow + 32gb of ram. 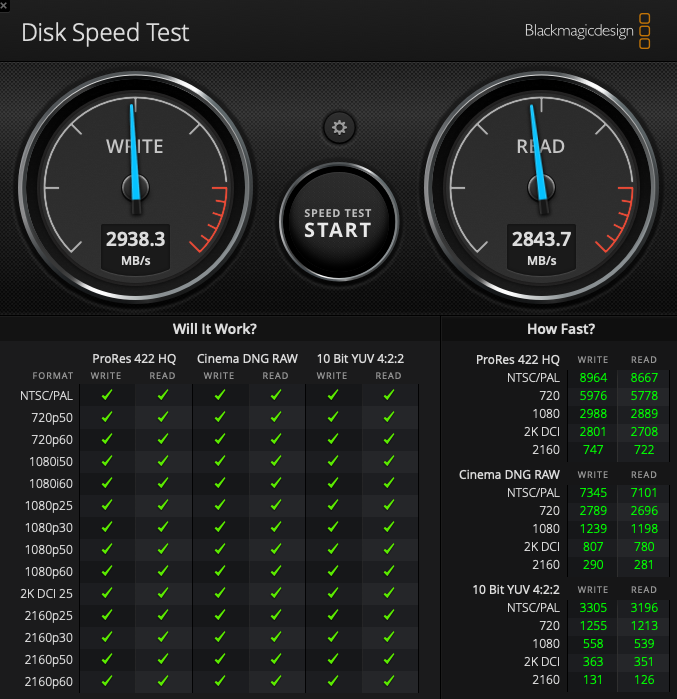 Blackmagic Speed tests added, 2882 Read/2445 Write (APPLE SSD AP1024M). There are TWO thunderbolt bus's not 1. LancesUK, StellarVixen and F-Train like this. I7/8GB/256GB here, very close reading speed, but only half writing speed. Which means full 40 Gbps on all 4 ports simultaneously, right? No, there's only one 4x PCIe connection per controller + display port link(s) + some USB capability. I'm currently connected over the HDMI port. That's ok. The way it works is the thunderbolt controllers ("bus") used in the 2018 Mini can support two ports each. Note how each port says "Up to 40 Gb/s?" That's because it hasn't actually been allocated any bandwidth because nothing is connected to the port. Thunderbolt controllers get fed bandwidth from PCIe lanes from the CPU or PCH/USB multiplexer and Display Port links from the GPU. The controllers used by the Mini can only handle 4 PCIe lanes (8Gb/s per lane) and two Display Port links total (which are around something like 23Gb/s or so depending on the DP spec). So, for instance, you could in theory connect a PCIe device like an eGPU and a Display Port monitor into the two ports of one controller and each would be fed properly, but neither port will use 40Gb/s. Or you could plug some combination of daisy chained devices into a single port that adds up to 40Gb/s, but no more. However, there's no physical way for the CPU to source 160Gb/s simultaneously though all four ports. There simply isn't enough I/O capability in the 16 PCIe lane CPUs used in the Mini to do this - between PCIe lanes and DMI there's 160Gb/s total, but that also has to be shared with the ethernet controller, USB, WiFi, SSD, T2 and so on. Got it, sweet, that is following my plan of attack then, eGPU on one bus, and an external SSD for another. Thanks for the detailed reply. So, let me get this right for all eternity, you can have only one full speed port per bus, right? I can have eGPU and external NVMe drive on two ports each on separate bus, with full 40 Gbps bandwidth used on both, right? But the moment I add third device, the bandwidth is gonna drop on the bus where I add this third device, right? So, what can use those 40Gbps on one port then? Nothing? I believe with the external enclosures it was the case that using any of the usb/storage connections would hamper performance because of all the interrupts the second device sends. Is that not the case here as well? With the right combination of resolutions, two daisy chained monitors. Or an eGPU/NVMe daisy chained to a monitor. I know, it’s a bit odd. Yes, if you use the external ports on the enclosure you have to share the PCIe lanes with both the enclosure AND the stuff plugged into it. Better to plug the USB stuff in directly to the Mac in this case. I'd love to know how many 2K and/or 1K displays this mac would support. Daisy-chaining on Thunderbolt included. Any clues? tubedogg and ElectronGuru like this. I've got an i5/8GB/256GB and get similar results to you, close on the read speed and half the write speed. I wonder if the 1TB is 2x500GB raided together? Would be interested to see other more results. I'm getting a 256gb model too. I've noticed a disparity with speeds posted online, and I wonder if it is indeed the 256gb drive (I should be getting a 500gb model in the future) or something that might even be corrected via firmware at some point (assuming that the 128 model has comparable speeds). In any case, it will be interesting to other benchmarks. I'd be more upset about this if we were talking read speeds, of course. EGPU is Hooked up and powering two 1920x1080 monitors. Nope. Nothing is wrong really. Read speeds on NVMe drives these days are limited by the controller and the amount of bandwidth given to the controller. So we haven't really hit the limit of the PCIe 3.0 4x interface allocated to the storage controller, but the posted read speed of 3 GB/s comes pretty close to the 4 GB/s bandwidth available. On the write side, an SSD in the same class will generally be faster (Depending on the controller) because the controller can write to more modules at a time. 128 GB will be the slowest, 2 TB will be the fastest. Wait, are you saying larger capacity SSD's are inherently faster than smaller capacity one's, and that it accounts for the disparity in write speeds between the 256GB model Mac mini and the 1TB machine? Am I understanding you correctly? If I am not wrong, daisy chain over DisplayPort MST still does not work in macOS? The only chain of display that can work is Apple's own Thunderbolt Displays? Hey OP, how is that i7 holding up? Have you pushed it a little bit harder? I’ve heard it overheats, can get to 100 and then throttle little bit, but it is mainly just under 100 when pushed to the limit. So far so good, I need to pull actual numbers, however before I had the eGPU hooked up, the Mac Mini's case was HOT, like Laptop burning hot, but once the eGPU was installed and I guess took a bunch of the work off of the CPU, it's been pretty cool. I ran a bunch of transcoding tasks last night and haven't it was cool to the touch. I'll pull temp numbers this weekend.